China has the potential to create 45% of the revenue across consumer goods by 2030. 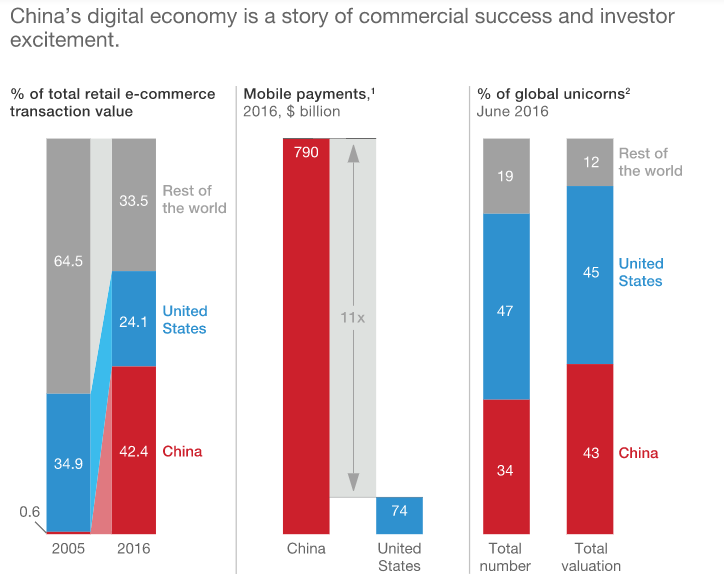 China’s digital economy has experienced massive growth over the last decade. About 10 years ago China accounted for less than one percent of the global e-commerce market; today its share is 42%. In comparison, the United States’ share of the market is 24%, down from 35% in 2005, as this graph illustrates. Such is China’s dominance in e-commerce, it now handles more transactions per year than France, Germany, Japan, the United Kingdom and the United States combined. That is according to a report from the McKinsey Global Institute, which assesses the strengths of China’s digital system, the degree of digitization of its industries and the scope for digital technologies to shift and create value. One explanation for China’s dominance is the explosion in use of mobile payments, which soared from 25% of mobile internet users in 2013 to 68% in 2016. In total, 731 million of China’s 1.4 billion citizens use the internet. Consumption-related mobile payments totalled $790 billion in 2016 – 11 times that of the United States, which boasts 262 million mobile internet users, the report shows. What’s more, one-third (34) of the world’s 262 privately held startups valued at over $1 billion – otherwise known as ‘unicorns’ – are Chinese, commanding 43% of the global value of these businesses. China’s venture capital industry has also swelled in recent years, from $12 billion between 2011 and 2013, to $77 billion – or 19% of the global total – between 2014 and 2016. According to the report, the majority of venture capital investment is in digital technologies such as big data and artificial intelligence (AI), and fintech companies. Of this investment, 42% has come from three of China’s internet giants: Baidu, Alibaba and Tencent. In addition, Baidu, Alibaba and Tencent have struck 35 international deals during the last two years, which compares to 20 made by the top three internet companies in the United States. As a result of these factors, China has achieved an annual surplus in digital services of $10 billion to $15 billion over the past five years, the report shows. However, China still lags behind advanced economies when it comes to digitization across its industries. For example, the United States was around five times more digitized than China in 2013. But that gap is closing. By 2016, US dominance had shrunk to 3.7%. And as this gap closes further still, China’s industries will experience major shifts in revenue and profit pools, the report predicts. It says that by 2030, digitization in China has the potential to shift (and create) value equivalent to 10 to 45% of the revenue pools across the consumer goods and retail, automotive and mobility, healthcare, and freight and logistics industries. 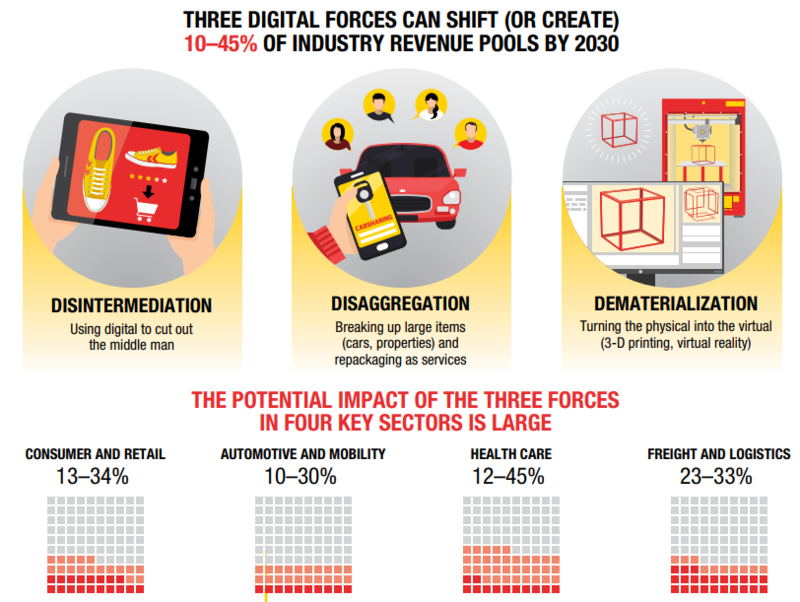 Three ‘digital forces’ – disintermediation, disaggregation and dematerialization – are expected to shift value from slow-moving incumbents to more nimble businesses, and from one part of the value chain to another. For large, traditional companies in particular, this means a substantial portion of their revenue could be at risk of being lost to new products, services and business models from digital companies. 1. “Adopt bold strategies” includes companies making preparations to disrupt their own business models in order to grow their customer base. 2. “Use the power of China’s vast digital ecosystem” urges companies to consider how best to collaborate with large digital platforms and China’s internet giants. 3. “Maximize value from analytics by using China’s data pools” includes establishing the business imperative for gathering and analyzing data, leading to a competitive advantage for companies. 4. “Build an agile organization for digital transformation” means making companies less hierarchical, instead organizing companies into smaller teams. 5. “Digitize operations based on a solid transformation program” because digital technologies are rapidly transforming the economy, meaning many Chinese businesses are unprepared. 6. “Engage with China’s policy and regulation” as the government has made it clear that digitization of the economy is a major priority. If these priorities are met, the report says China could lead broader debates on global governance issues such as barriers to foreign competition, reciprocity and digital sovereignty in the coming years.